I picked up Wendy Mogel's newest book The Blessing of a B Minus the same day I decided to watch the 1977, Oscar-winning, Woody Allen movie "Annie Hall." Both are a mix of Jewish culture and Americana; the movie is about adults and the book is about adolescents. In either case, you can't go wrong reading or watching. 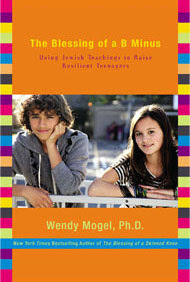 Mogel's Talmudic psychology is excellent advice for those parents who are in the throes of raising teenagers. The personal cases she cites and the experiences raising her two daughters are perfect for convincing the most reluctant believer of how Jewish religion and raising children are compatible.